Ebenee and Arthur were such a pleasure to work with. They were having a destination wedding at the Majestic in Punta Cana. 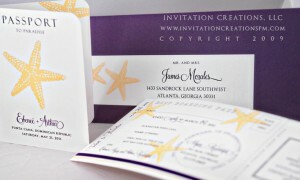 They didn’t come in with the idea of doing a passport / boarding pass invitation, but once they saw some previous ones I had created, they really became enamored with it. With a count of almost 300 invitations, budget was something we had to keep in mind. We also created several goodies for her day-of stationery and I can’t wait to share those with you next! Enjoy!